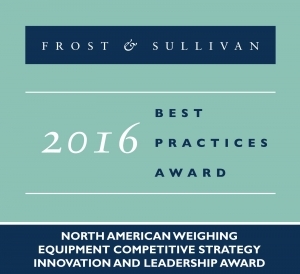 SAN JOSE, Calif., Sept. 15, 2016 /PRNewswire/ — Based on its recent analysis of the weighing equipment market, Frost & Sullivan recognizes A&D Weighing with the 2016 North America Frost & Sullivan Award for Competitive Strategy Innovation and Leadership. Another important advantage of A&D’s product lines is its software-based equipment. Hardware is often the most expensive component of weighing systems, which means that maintenance, repairs, calibrations, and replacements will be expensive and time consuming. A&D leverages its deep experience in digital signal processing to keep the hardware simple.